You can count the ingredients on one hand—yeast, flour, sugar, fleur de sel, and LOTS OF BUTTER. And it's prepared similarly to a croissant dough. The fleur de sel dough is turned frequently with butter. And on the last step it gets a liberal sprinkling of granulated sugar. She's right - these things are beyond amazing! A few weeks ago I found myself without a Farmer's Market to go to on Saturday, so I popped into Les Madeleines instead! Long story short, I'm now addicted the decadent goodness that is Kouing Aman! The inside of that looks unlike any baked good I've seen before! Great pictures. Yum! Hey, you are the first Utah food blogger I've discovered. I kept wondering if I was the only one. Then tonight someone left a comment telling me about your blog. I'm in Salt Lake, and I've been writing my blog since April 2005. Kalyn-glad to meet you. We should hold a First Annural Utah Food Blogger's Conference with just the two of us, ha! Your site looks great. I"ll be a frequent visitor. lisaSD-I lucked out on the photos. The pastry was just too good to NOT look good. Alicat-Thanks for the positive feedback. It's great meeting new folks in blog community. Those look wonderfully flaky and sound really good. So the outside is just sugar? (I have danish dough in the fridge, now I want to try something like this) Must go look for recipe. Danish dough would be a great way for the homecook to do this. Romina won't give me her exact recipe. But I've witnessed the folding. After she rests and turns the dough two times, at the third step (where most home cooks would be with puff pastry or danish dough) she carefully sprinkles a thick layer of granulated sugar down 2/3 of the dough-rectangle. She folds it into thirds and rolls it out to a square (this gets tricky) and cuts it into 9 equal squares. Inevitably, some of hte sugar with come out, you can re-apply to the exerior. So what you'r left with is a sugar-coated square of many layers of dough. She makes them in ring molds (about 4-inches) placing the square inside and tucking the ends in so that they look like a flower. Pat it down so that it's relatively flat. And bake in a 375 degree oven until it's puffefd and golden brown. Sweet! Thanks Vanessa. Tomorrow is my day in the kitchen so this will come in really handy. Ever since I've read this entry I have been obsessed with finding these in NYC. I am sure that they exist somewhere in this city! You mentioned that there may be a few bakeries here that make these. I have done exhaustive searches, to no end. Do you remember which bakeries make kouing aman in NYC? Please tell me before I die! These sound sooooo tempting the way you describe them. If I can't find them here, I may have to take another trip to Utah for them! How could I have not had those when I lived there???? I probably never would have moved!!! You are lucky to have a friend like Romina. thanks vanessa for getting me hooked. my friend lindsey and i finally made the trip to Fauchon and they only had 7 left!!! we cleaned them out! unbelievable! i almost wanted to head down to bouley to clean them out as well. this may be a weekly ritual. thank you, again. I found this blog in a roundabout way. I was on www.designmom.com and guest blogger Lindsey Johnson inserted a link to this blog. I was intrigued b/c I only know of one person who makes Kouing Aman, Romina Rasmussen. I read further down and discovered you know her too! I'm a regular at Les Madeleines--I even have a "Les Madeleines" budget :) I've lived in SF and Boston and LOVE food. If you're interested in combining forces to do a food blog for SLC I'd love to collaborate with you....or maybe a column in the Trib! Hi, just to let you know that we have just come back from our second holiday to Brittany (the home of Kouing Aman) and accidentally discovered it in a pile of petit dejourners pastries. Reading the Yummie Blankie description perfectly encapsulates it's wholly dangerous delights. I would happily have eaten 12 a day for the whole holiday and have given in to a massive heart attack at the end of it, had my family not slapped me back into reality! I "discovered" these deliciously salty, sweet, crispy, chewy, tender heavenly pastries about two years ago while staying with family in Salt Lake City. At every subsequent visit, there was never a question where my first stop would be. Once I even let my in-laws have a taste of my most treasured posession. THAT was a mistake. A few hours later when I crept into the darkened kitchen for my much-anticipated midnight bliss-in-a-little-white-box, I was horrified to see my empty little box lying unceremoniously in the trash can! No more sharing! Now I eat my kouing-aman in my car, slowly savoring every bite BEFORE I travel up Capitol Hill to my DeSoto Street destination! I am a French student learning international marketing in a University of Brittany. 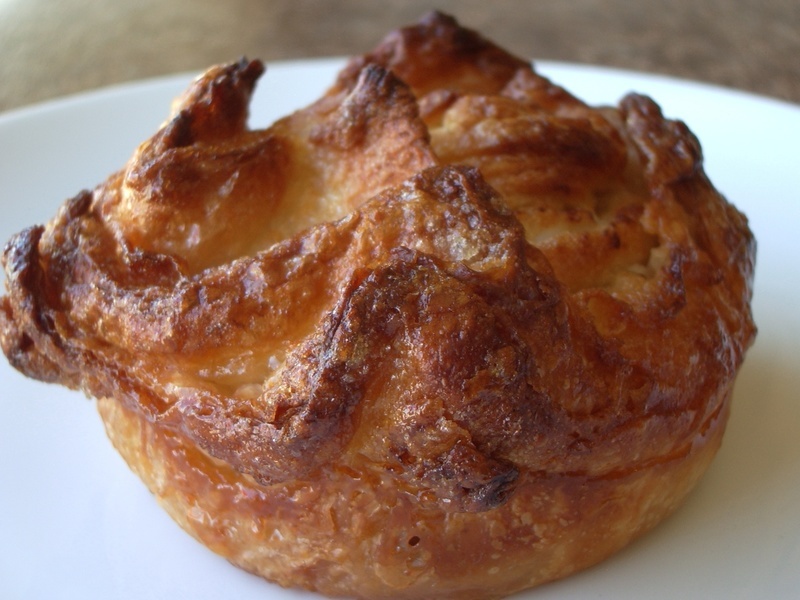 Currently working on a project about exporting kouign amann in NYC, I do not know in which place it will be better to do it. So if you have any opinion for me…I would be very grateful. 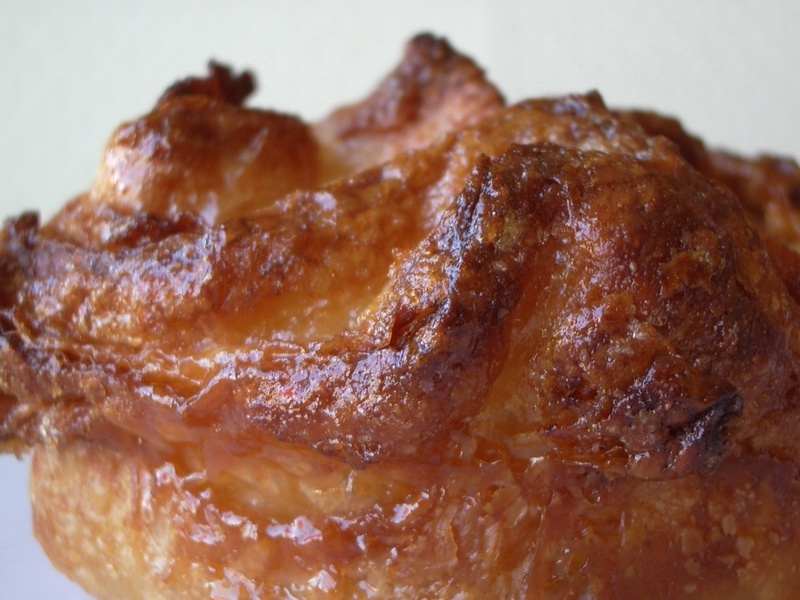 As it has been said before, and if I am right, you said that there are a few bakeries in NYC selling Kouign amann…but which are? I cannot find information on the internet, so I come to ask you if you know more about it. 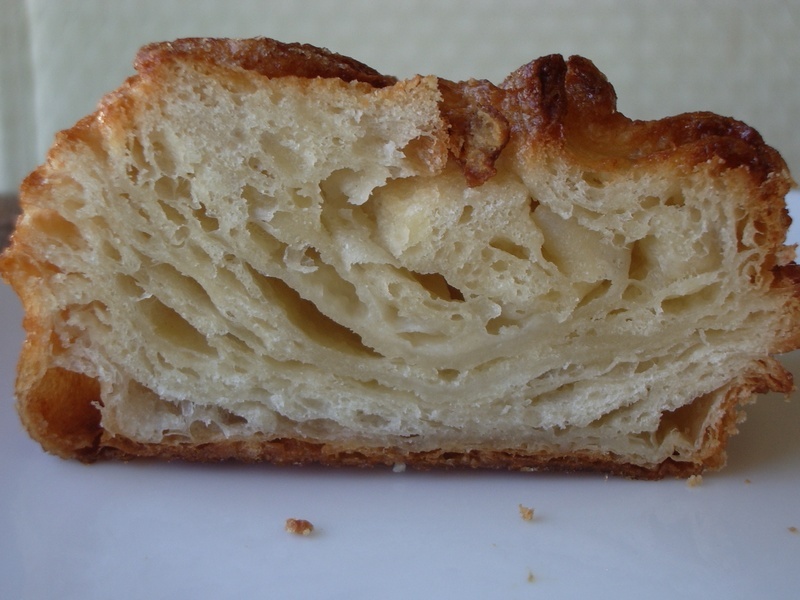 I spend 2 months in NYC last summer(in 2008) and I did not find any kouign amann in this big city. So it is the reason why, with friends, we are trying to do our project about this Britannic product. Thanks for reading, and for answering me. Forgive the blog reply, but I could not find an email address for you. In terms of kouing aman in NYC, I think it was Bouley and one other. Only two last I heard. Another place in Los Angeles or someplace making it. My source for Kouing Aman is in Salt Lake City, Utah. A chef with her own patisserie here has been making kouing aman for quite some time. Her venue is called Les Madeleines. The kouings are very popular here, very addictive.